A Los Angeles City Council committee agreed Monday with one of its members, who says the National Rifle Association is one of the biggest roadblocks to gun safety reform, in signing off on a motion that would require city contractors to disclose any ties they have to the organization. Councilman Mitch O'Farrell's motion, if passed by the full council and signed by the mayor, would not ban NRA-connected contractors from doing business with the city, but would require them to disclose any contracts or sponsorships they have with the gun rights advocacy group. The City Council approved a similar ordinance last year that requires contractors or prospective contractors to disclose that they have placed bids on President Donald Trump's border wall. Although it did not ban those contractors from working with the city, the ordinance sent the message that Los Angeles would be unlikely to hire a contractor with ties to the wall. "For the sake of transparency, the city's residents and stakeholders deserve to know how the city's public funds are being spent, and whether taxpayer funds are being spent on contractors that have contractual or sponsorship ties with the NRA," the motion states. It’s a piece of trash, liberal city that wants to put a target on these people’s backs. In the land of Antifa, harassment and intimidation will follow. 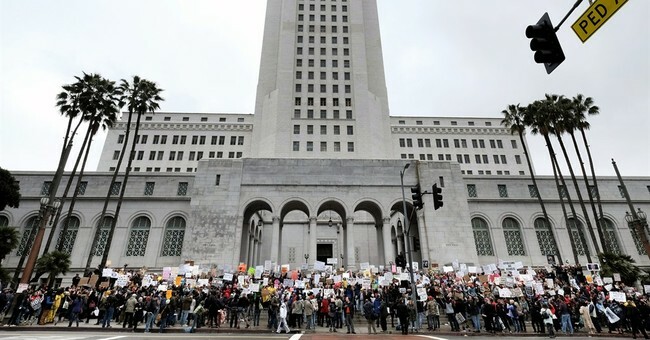 We’re not going to ban you from working in LA, but we’ll just unleash the hounds, or leave you open to such attacks, from rabid progressives, says city hall to Americans who support our Constitution and Second Amendment freedoms. Maybe nothing will come of this, but I doubt it. Liberals hate us. I don’t have a lot of faith with members of this mob.